While you’re taking trips down memory lane watching Netflix’s new original, Stranger Things, you make mixtapes again as well…of movies and TV shows. 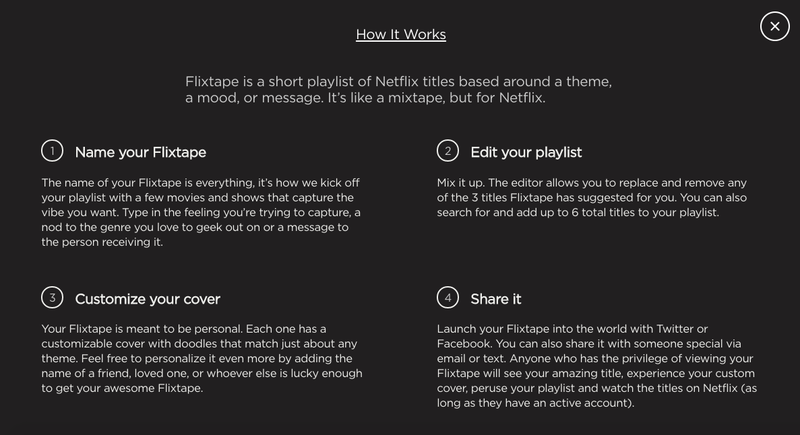 Say hello to Flixtape, a feature that allows users to create quick and easily accessible playlists of their favorites on the streaming service that can also be shared with friends via Facebook, Twitter, email and text. Netflix can either recommend selections for you or you can simply let it know what you’re in the mood for. Just type in a genre, title or keyword of any sort and you can add it to your list of up to 6 moves, shows, standup specials or documentaries. Once you’ve created your Flixtape, you can share it with that friend who keeps asking for recommendations in your Facebook newsfeed. Or you can show your crush what you’re into, and see if they dig it too…If not, I’m sorry. I’m sure someone out there likes that thing that you like too. What does your Flixtape list look like? Share with us on Facebook or Twitter!